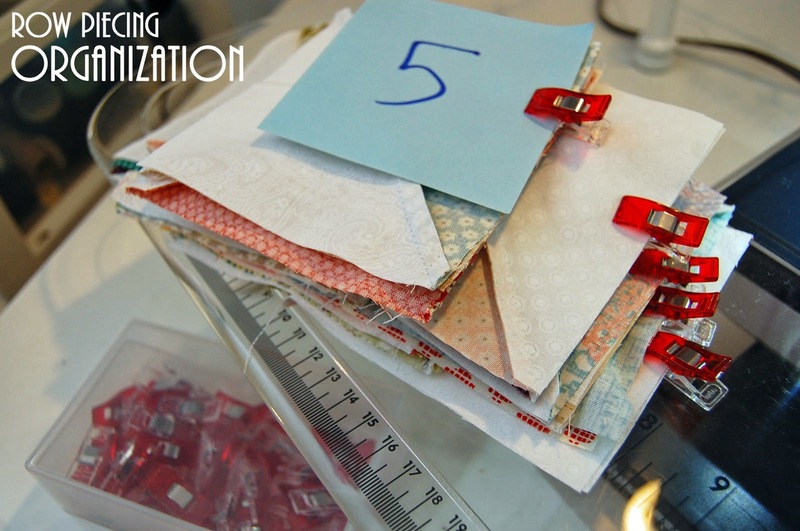 It's been a while since I have posted a "Sew with me Sunday" tutorial / tip..... but this week as I was sewing up my Project Quilting piece, I developed an organizational strategy that I thought was worth sharing! This week's quilt design wasn't quite as straightforward as some of my designs in the past - much harder to tell as I was chain piecing squares if I had accidentally rotated one of the squares and was sewing the "top" of the pair - rather than the right side, etc. 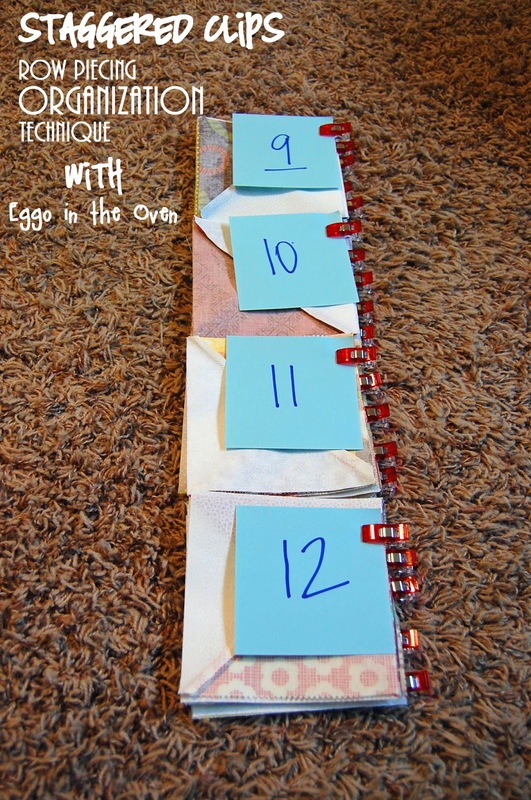 So I needed some sort of strategy to keep track of the correct side to sew - and where each row started / stopped. Confession: I severely dislike pins. Straight pins, safety pins, push pins..... you name 'em, I don't like them. So when I discovered Wonder Clips - I KNEW I needed them ASAP. While they don't work for EVERY situation you would use pins - they're a pretty great substitute most of the time! 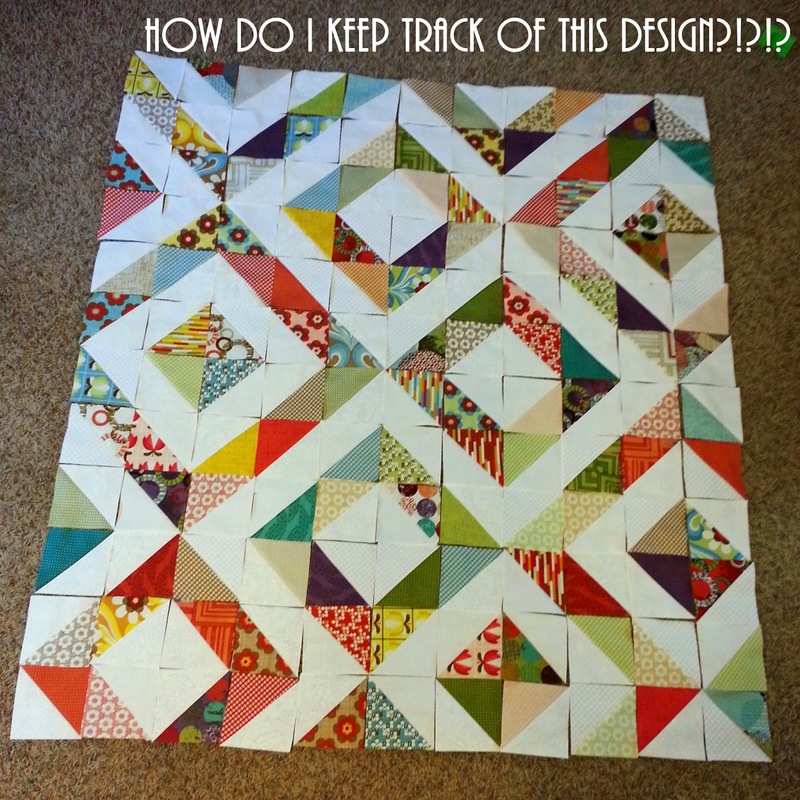 I had all my half square triangles laid out in my final quilt design. I started at the left side of the quilt and laid the square from column 2 onto the one from column 1 (right sides together), column 4 on 3, column 6 on 5, and so forth. Because this quilt has 11 columns, I had one square that wasn't part of a sandwich (yet) - column 11's square - for each row. Then I got out my Wonder Clips . I wasn't clipping them together to line up the sides perfectly ready for sewing - I was clipping with the purpose of keeping track of which side of the square to sew, and which pairing (2&1, 4&3, etc.) this was. Here you can see rows 9 through 12 of my quilt - with the clips staggered for each row. And a dump truck. I used sticky notes to write labels for each row - and just clipped them onto the column 1 & 2 pairing. 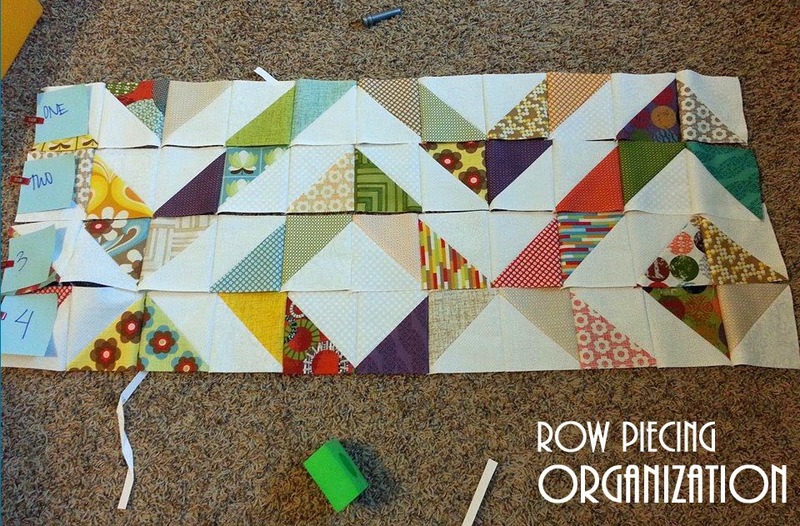 You can see that column 11 is not paired up - I left it positioned just as it would be for the quilt. A close-up shot of row 12 - see how the clips are staggered? 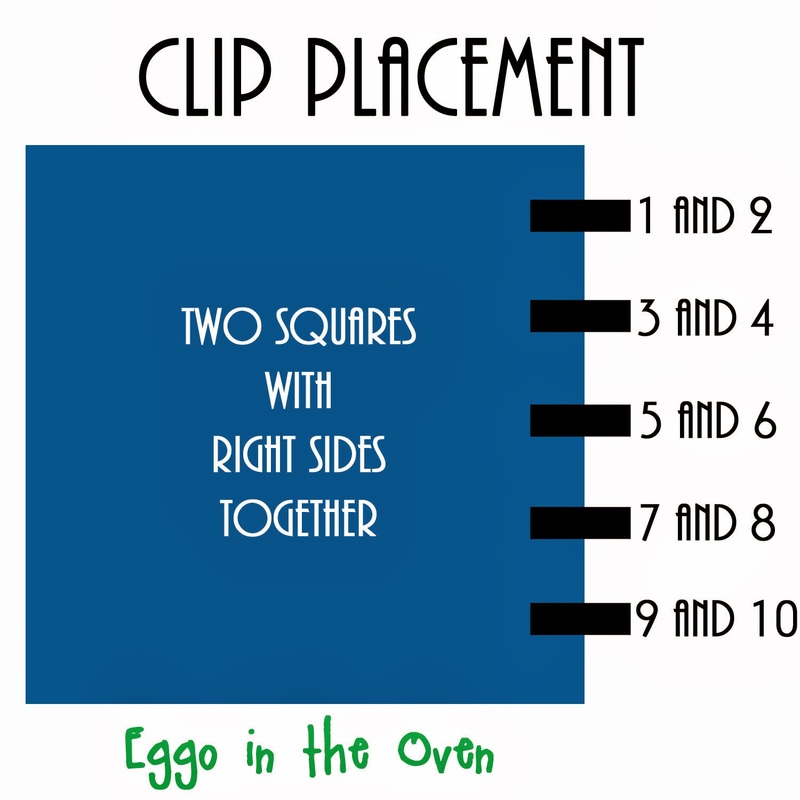 Another bonus - - - this makes it so that your clips don't stack directly on top of one another! Then I stacked the piles for each row on top of one another - in numerical order. This stack is rows 9 through 12. I found a stack of 4 rows was perfect - I wasn't afraid it was going to topple over. 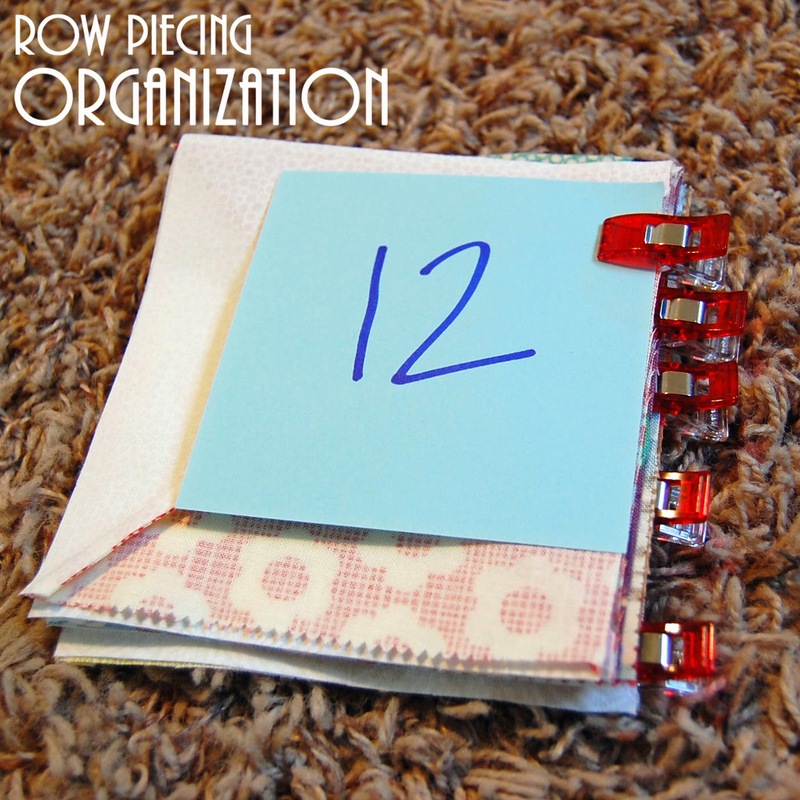 As I sewed up each pairing, I continued to clip the number to the first bit of each row. 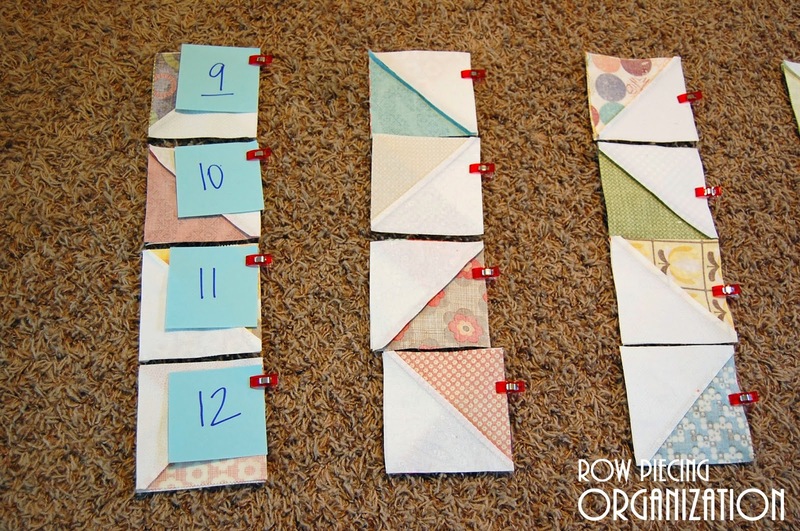 I sewed 4 rows at a time - so this helped me not lose track of where each row started and stopped. This picture shows rows 5 through 8. 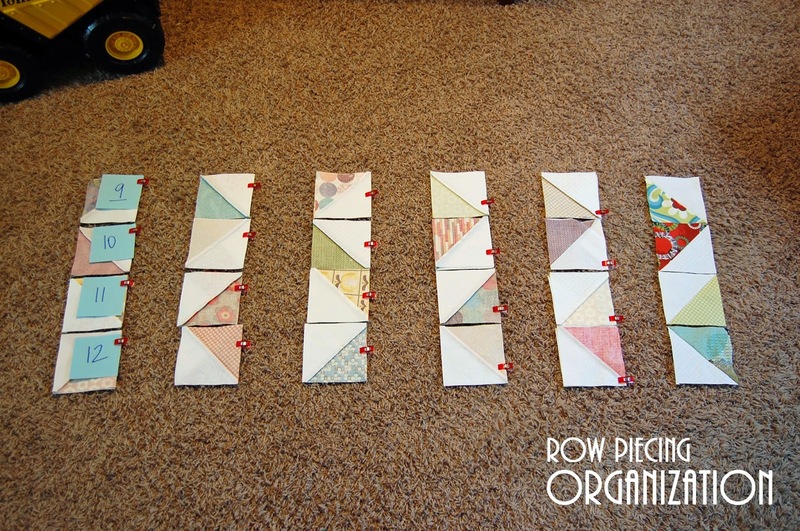 At this point I had sewn together the pairs - columns 1&2, 3&4, 5&6, 7&8, and 9&10. Then I clipped the column 11 square to the 9&10 pair - ready to sew up during the next round. After that, I would sew together the 1&2 pairing with 3&4; 5&6 with 7&8, and as mentioned above 9&10 with 11. I kept clipping that number marker to the first block after every step. When I got done with each row, I'd have the row label clipped to the column 1 square for each row. I left these on until I sewed all the rows together - even when I was pressing seams, etc. - so that I didn't lose track of the row number or which side was the "left" side of the row and which was the "right". No.... I do not know why I wrote out the numbers "one" and "two" - when I went to write "three" I thought "um..... the number would be sufficient!" I hope you like this little tutorial. I'm sure this isn't a novel idea - but it was something I hadn't come across before (though I can't say I've looked) and that worked GREAT for me / this project. 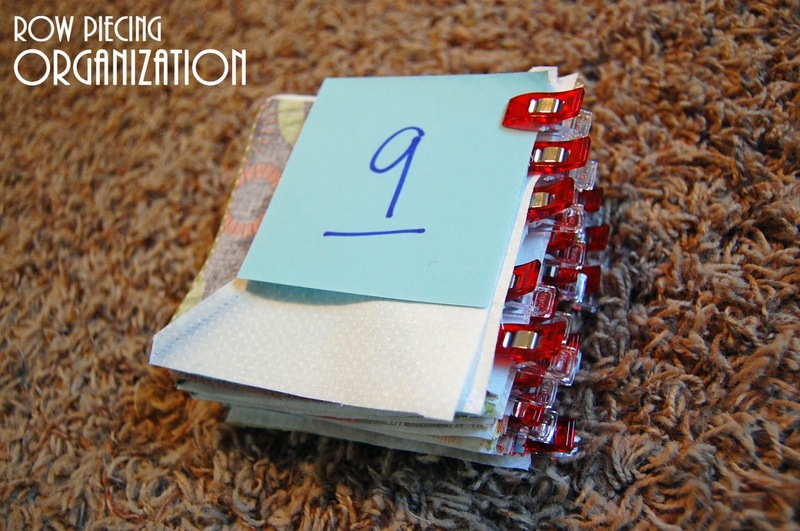 When I shared that final picture in the Challenge Quilts group on Facebook there were at least a few people interested in my labeling technique...... so here it is! 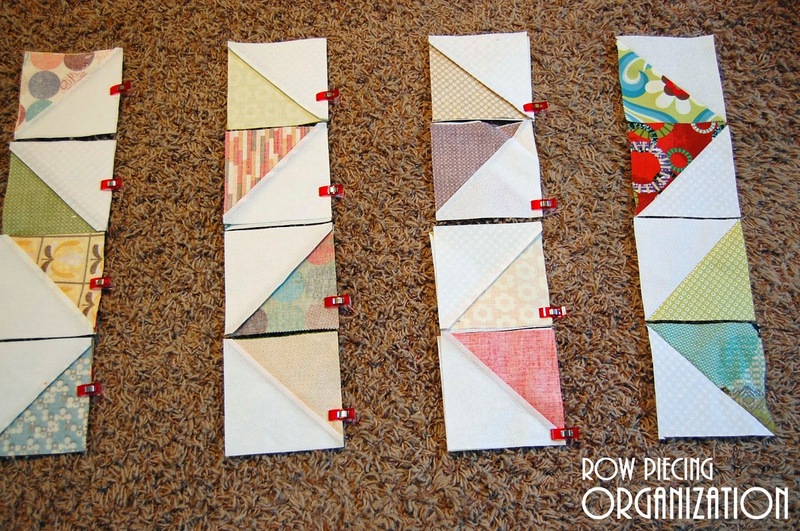 This post Staggered clips: a row quilting piecing technique first appeared on Sew & Tell with Mama Eggo and includes my honest, unsolicited opinion of a product, Wonder Clips for which I was not compensated.